Stems: Spreading to erect, stout, simple or somewhat branched, leafy, densely covered with star-shaped hairs. Leaves: Alternate, lowest long-stalked, others short-stalked, oblong-lanceolate to linear-lanceolate, 2 to 4 inches long, 1/4 to 1 inch wide, firm; margins toothed with shallow, rounded teeth. Inflorescences: Panicle, compact, many-flowered, conspicuously leafy; flowers clustered in leaf axils. Flowers: 1/2 to 3/4 inch wide; stalk stout, shorter than calyx; calyx 1/5 to 2/5 inch long, 5-lobed; lobes lanceolate to triangular; tips pointed; petals 5, 1/4 to 3/4 inch long, color variable, red, orange, or salmon, often drying violet; tip notched; stamen column half to nearly as long as petals; carpels 10-15. Fruits: Capsule, egg-shaped to ellipsoid, 1-3-seeded, star-shaped hairy or nearly glabrous; seeds kidney-shaped. Habitat: Waste areas and roadsides; sandy or rocky, limestone or gypsum soils. Distribution: Southwest 1/4 of Kansas. 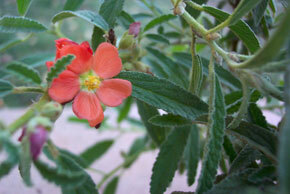 Uses: The Kiowa decorated their homes with narrowleaf globe mallow flowers.